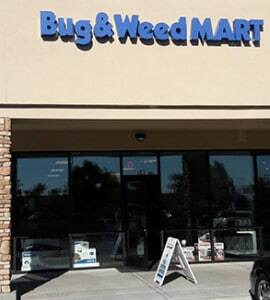 Bug & Weed MART Tempe is located in the Fry’s shopping center on the northwest corner of Baseline & McClintock. We are right across the street from Chapman Chevrolet. The Tempe Bug & Weed MART is centrally located in the Phoenix metro area, so it’s convenient to stop in and see what products we have that will help you eliminate unwanted pests and stop an infestation before it starts. We have test strips so you can trap insects and bring them into our store so we can identify what they are and sell you what you need to get rid of them. If you have weeds, we can let you know the schedule you should be following when using pre-emergent so that weeds are no longer a problem. If you need help figuring out why you now have bugs you never had before, we can help you figure out how to get rid of them. We will give you the advice you need so you can take care of all your bug and weed issues by yourself. Our products are professional strength, while still safe enough to use around your family – including your children and pets. Stop in at our Tempe Bug & Weed MART location today to see how we can help you get rid of any bugs and weeds that might be bugging you.